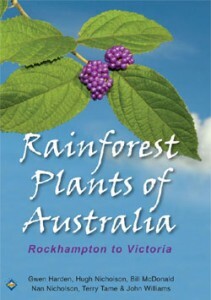 Gwen has edited, authored or co-authored numerous identification guides that have enabled the identification of plants within New South Wales (as in the 4-volume Flora of New South Wales) and in rainforest from Rockhampton (Queensland), south through New South Wales to southern Victoria. In 2006 Gwen published the latest field guides through Gwen Harden Publishing so that the books and the USB could be distributed at a reasonable price. In December 2016 this key and information was released as an app for mobile devices. This app is based on the USB, Rainforest Plants of Australia and includes all the 1 140 species, fact sheets and general introductory sections that are in the USB. The interactive key is illustrated and easy to use. The app will enable you to have this powerful identification key and information system in your pocket (or bag) at all times and in all places. You will soon wonder how you ever lived without it! Authors: Gwen Harden, Hugh Nicholson, Bill McDonald, Nan Nicholson, Terry Tame and John Williams. This interactive USB provides illustrated descriptive information and an interactive key (using the Lucid software) to species of rainforest trees, shrubs and climbing plants of subtropical eastern mainland Australia, from Rockhampton to Victoria. Each of the 1140 species has a factsheet with description, line drawings and images. In all, over 12,000 images are included. 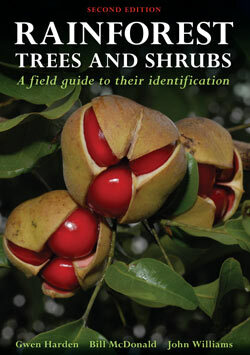 An enlarged and revised Field Guide to the identification of rainforest trees and shrubs from Rockhampton Qld and down through the States of NSW and Victoria. It includes a key to species, descriptions of 850 species (an increase of 309 from the earlier “Red Book”, first published in 1984) each with leaf and fruit drawings. Authors: Gwen Harden, Bill McDonald & John Williams. 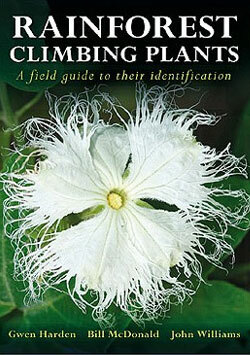 A Field Guide to the rainforest climbers of Victoria, New South Wales and subtropical Queensland using vegetative characters. This is a major update of the “Green Book” first published in 1980 which now covers mainland Eastern Australia from Victoria to Rockhampton Qld. Descriptions and illustrations provided for 265 species, somewhat more than double that in the original edition.